Gorgeous single saucer in the Franciscan Madeira pattern. 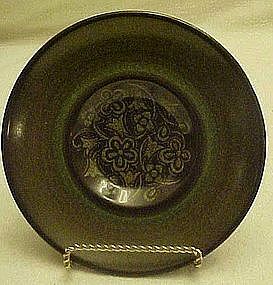 Pretty scrolls of green flowers center with a green band on a matte sheen chocolate glazed body. Perfect condition and I have 6 available. See other pieces I will be listing to this set in my catalog.